Depending on the perspective one goes into ‘The Creature from the Pit’ with, this story can either be deemed fairly enjoyable or a horrible disaster. On the one hand, there is an almost fairy tale quality to the forest setting and evil queen figure in Adrasta, and the atmosphere and morals discussed are quite commendable. However, the lack of depth, questionable direction, and ultimate failure to realistically realize the titular Erato are distinct shortcomings that cannot be ignored and keep the tale and its component parts from reaching their full potential. Of course, the constant saving grace no matter how poor an individual episode or story may be at this time is Tom Baker, and he is clearly content reveling in irreverence and adventure-seeking while casting aside the more serious side of the Fourth Doctor so prominent early in his tenure. While there is one dubious scene featuring an attempt at communication with the creature, Baker’s ability to sell these fantastic events as incredibly serious and to jump from frivolity to immense anger instantaneously are a true testament to the actor, and the Doctor’s willingness to give the creature the benefit of the doubt rings very true to the character. Although Lalla Ward suffers from the fact that this is her first story filmed and so has to play her version of Romana more in line with Mary Tamm’s, this unsteady characterization compared to the previous two broadcast stories still holds some very dynamic moments for the new companion. At the same time, though, David Brierley’s new take on K-9’s voice and mannerisms is somewhat jarring after the masterful work of John Leeson in the role. Although the realization of Erato and the wolf weeds fall short of expectations, ‘The Creature from the Pit’ does manage to create arguably the most organic and realistic forest setting of the classic series, and Adastra’s soldiers are resplendent in their uniforms. It is also quite successful in subverting the customs and norms of the time with the distinctly non-humanoid Erato ending up not being the villain of the piece, and the creature using the larynx of whoever is holding the communicator is a nice touch. The 40,000-year lifespan and the abilities of the Typhonian race tie into the conclusion perfectly, and it’s fitting that the solution has been plainly presented in pieces throughout the narrative. Adastra meets a fittingly gruesome end, and the production staff does show that it has the ability in some instances to make Erato a credible threat as the creature proves vital to saving the day. 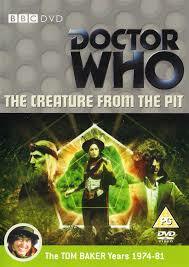 There are plenty of good intentions and lessons scattered throughout ‘The Creature from the Pit,’ but unfortunately there are simply too many missteps with the supporting cast’s performances, direction, and realization of the titular creature to be deemed a success. Due credit must be given to those unafraid to try something completely novel and who actually do succeed in some instances, but only those viewers with an open mind ready to rely on their own imagination more than what is on screen will fully enjoy this beyond Tom Baker’s mesmerizing performance.